Do you have a high traffic area in your livestock operation that gets muddy or rutted during seasonal weather? 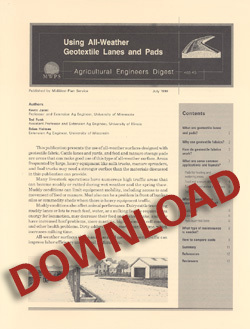 Using All-weather Geotextile Lanes and Pads describes what geotextile material is and how it can improve your operation. Detailed drawings and descriptions will guide you through construction.